Klout is a website and mobile application that leverages analytics derived from social media channels to measure a user’s online social influence, otherwise known as the Klout Score. The score is a numerical value between 1 and 100, which is determined by gauging the size of a user’s social media network and then correlating the content created to see how other users engage and interact with it. Klout aggregates, measures, and analyzes several social media activities to identify a user’s Klout Score. These activities include social media actions like re-tweets, likes, comments, shares, etc. Once a Klout Score is given, this will enable users to assess their influence and how to improve on it. The platform ultimately helps social media users, whether as individuals, organizations, or enterprises, to recognize the most influential topics, influencers and influencees as well as other significant information that surrounds a social account’s spatiality. How does Klout influence your business? Aside from providing your with a simple measurement platform to see just how big and wide your online influence is, your Klout score helps you evaluate and analyze the performance of your online marketing campaigns. The bigger your score, the more likely your campaigns are reaching your target audience. A high Klout score is also a big asset to your portfolio, which can be a significant edge over your competitors. That is very much true is your business is operating in an industry where reach is critical to the realization of your business goals, such as marketing, social media, and public relations to name a few. Klout helps you determine which social media channels are helping you succeed and which accounts require attention. As everything is collected and aggregated, you can actually see the numbers of likes, shares, tweets, and mentions your brand is getting. With Klout, you have all the information you need to devise viable online marketing campaigns, become relevant in social media, and drive your sales through the roof. 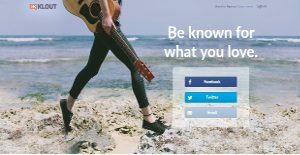 Klout also enables you to identify influencers who can help you market your brand and reach a wider range of people that are interested in your product and services. You can also see which topics are relevant to your business, enabling you to conceptualize and implement campaigns that are very significant and to which your target audience can easily relate to. Simply put, Klout allows you to establish yourself as a trusted brand by delivering you a platform that helps you comprehend big or small your online influence is and how you can stand out from the rest of crowd. It is essential to realize that hardly any software in the Marketing Software category will be a perfect solution able to fulfill all the needs of various business types, sizes and industries. It may be a good idea to read a few Klout reviews first as some solutions can dominate exclusively in a really small set of applications or be prepared with a really specific type of industry in mind. Others can work with an idea of being simple and intuitive and therefore lack complicated functions needed by more experienced users. You can also come across services that cater to a wide group of users and provide a rich feature set, however that usually comes at a more expensive cost of such a software. Ensure you're aware of your requirements so that you choose a service that has specifically the features you look for. How Much Does Klout Cost? We realize that when you make a decision to buy Social Media Monitoring Software it’s important not only to see how experts evaluate it in their reviews, but also to find out if the real people and companies that buy it are actually satisfied with the product. That’s why we’ve created our behavior-based Customer Satisfaction Algorithm™ that gathers customer reviews, comments and Klout reviews across a wide range of social media sites. The data is then presented in an easy to digest form showing how many people had positive and negative experience with Klout. With that information at hand you should be equipped to make an informed buying decision that you won’t regret. How much of an influence are you? What are Klout pricing details? What integrations are available for Klout? Pros: You may not have a clue how influential you can are on the internet. You probably have no idea what topics you're widely influenced in. Registration is easy and quick to do. Getting it to integrate with your social media platforms is astonishing. You'd be shocked with how seamless everything is. Believe me. Cons: Right its site is having some issues. It was a little disappointing since I expected a smooth operation all throughout. Its latest beta UI needs a bit work. Pros: What I like about Klout is the ability to see person’s influence across various platforms. I can see the person’s engagement, his content and even his impact. Klout is great tool for making comparison of user’s influence. Cons: Klout still needs some improvements on their platform. It doesn’t take consideration of external sites. They need to take into account person’s web mentions and some other predictive analytics instead of person’s profile influence. It's great for iniital use but it's not recommended for constant use. If you need more information about Klout or you simply have a question let us know what you need and we’ll forward your request directly to the vendor.